Social Media is a world where anything goes, and can even go viral. It’s creating a platform to connect unlike any generation before has experienced, but yet, billions of its’ users are experiencing a virtual health crisis. Join social media and social health expert, JULIA GARCIA, as she helps students navigate all sides of this tech phenomenon including: The good, the bad and even the addictive. GARCIA helps students explore the intersections between approval metrics, the desire to connect, and what happens when we have 24/7 access to social capital that is shifting culture at the click of an icon. This is an unfiltered conversation about everything from bias algorithms, to dopamine hits and addictive highlight-reels on loop that leave us feeling even more disconnected than before. In a culture where the rules are blurred and new forms of bullying and harassment are reaching epidemic highs, there is no better time than now to rewrite the roles we each play on social media. PERMISSION TO BE IMPERFECT, creates a space for more authentic and inclusive story-feeds behind the screens and face-to-face. Students will approach online behavior through an unfiltered lens, get real about the comparison game, and challenge each other to leverage this powerful platform for positive change. Since 2011, Julia Garcia has been empowering audiences all over the country, by uniquely infusing performance art into her powerful lectures. As a refreshing and current voice who is encouraging students to stand together on all issues we traditionally stay silent about, Julia is creating a safe space for students to positively address issues of identity, relationships, substance abuse, gender issues, current events, leadership, and diversity. 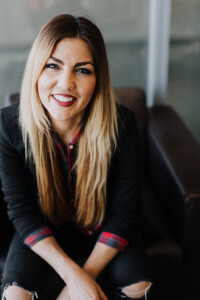 JULIA GARCIA’S latest startup, THE REWRITE PROJECT, won the audience impact award at the largest Entrepreneur pitch event in the state of Arizona. Within the same month, JULIA’S work with teens in high risk environments, had her featured as one of 15 select speakers, at the first HOPE^2 Talk in Arizona, alongside some of the most prominent and leading Educators in the country. A few days after that, JULIA was the keynote Speaker for the first NO PLACE FOR HATE celebration, which is a Diversity & Inclusion initiative to end bias and bullying in schools. As a student, Julia was a scholar athlete for the women’s soccer team, a writer for the campus newspaper, a journalist reporter for the local news station, and president of the Women’s Association.